Nuance Recognizer is the best-of-breed speech recognition software that dramatically increases the efficiency of your self-service solutions. It uses neural network-based recognitinon to provide more accurate, conversational responses, delivering high recognition accuracy and enabling more natural conversations. Nuance Recognizer can perform well even when faced with challenges such as noisy environments, mobile phone callers, Internet-based calls, regional accents, local dialects or multiple languages. It learns from its mistakes and makes automatic adjustments to improve over time. Nuance Recognizer 11 is available for more than 75 languages and dialects. 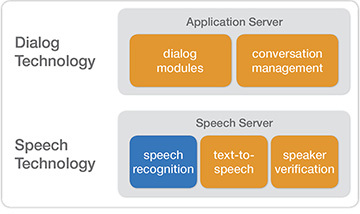 Built upon years of experience across six different product lines, the Automatic Speech Recognition (ASR) engine is used around the world. It can even recognize several language grammars in parallel to address the needs of caller populations that speak multiple languages. It delivers the industry's highest recognition accuracy even as it encourages natural, human-like conversations that create more satisfying self-service interactions with customers. A built-in, Natural Language Understanding (NLU) engine understands and interprets a broad range of words, phrases and full sentences. The engine returns a simple, structured interpretation of the meaning which allows users to interact with the system in a more natural and intuitive way. Cloud-ready capabilities, sensitive data management and advanced monitoring and deployment management, allows users unprecedented flexibility in creating and operating speech resources. Together, these capabilities add up to unparalleled levels of accuracy, reliability, and ease of use that will transform the way you care for your customers. Reduce call durations and increase containment and self-service success with accuracy that reserves agents for more complex, highvalue tasks. Quickly enable quality speech by using ready-made Language and Domain Packs built with machine learning. Multi-layer customization allows tuning to specific needs. Custom weightsets keep the focus on concepts that matter most. Callers experience the freedom to use their own words to navigate to answers and complete more complex tasks. Nuance Recognizer 11 considers context and intent - and holds that insight through multiple steps - enabling both proactive suggestions and faster resolution, leading to improved customer satisfaction. Nuance Recognizer 11 learns and improves on its own over time thanks to built-in tuning. What's more, Nuance Insights gathers the business intelligence needed to recommend broader tuning initiatives. This document provides the availability status, support status, and transition dates for Nuance Recognizer. “On or After” indicates an earliest possible transition date when a specific date has not yet been established. Nuance product availability and support policy, including relevant terms, are defined in the governing license agreement. Exceptions to this policy, including the availability or support stated herein, must be granted in writing by Nuance via Diagenix. Support for More than 75 Languages and Dialects. Machine Learning and Automatic Adjustments to Improve Accuracy Over Time.